What I love about Fear the Walking Dead is that we are brought to two different environments away from backroads of The Walking Dead’s Georgia and Virginia. The urban setting of Los Angeles and now, the high seas during the zombie apocalypse make for vastly different dynamics. The first season of the Walking Dead was a delightful slow tease that added many layers of suspense. The build-up to the explosive finale saw some wonderful characterization, a key element for viewers to latch on to the new cast. All these give or take a few more made the first season of FTWD slightly better than the first season of The Walking Dead. This second season that began two weeks after the end of TWD’s Season 6 is well… still another tease that is both good and sometimes, a little slow. You can be forgiven if you’re looking some carnage and mayhem as TWD S1 almost dived at it from the beginning and torpedoed into more mayhem when Rick Grimes’ not so merry band of survivors moved into Hershel’s farm. Here’s what makes TWD a global phenomenon (borrowing some — not all — f the criteria outlined by Forbes magazine) and let’s see how it correlates to FTWD S2. Good story (directing, writing, and acting) — You can say that S2 is still just as slow. It’s fine as this is literally days or a week or two after the firebombing of Los Angeles by the US military after Operation Cobalt was put in effect. We’re seeing the characters come to grips with this frightening new world where nothing is safe, sacred, or rational. 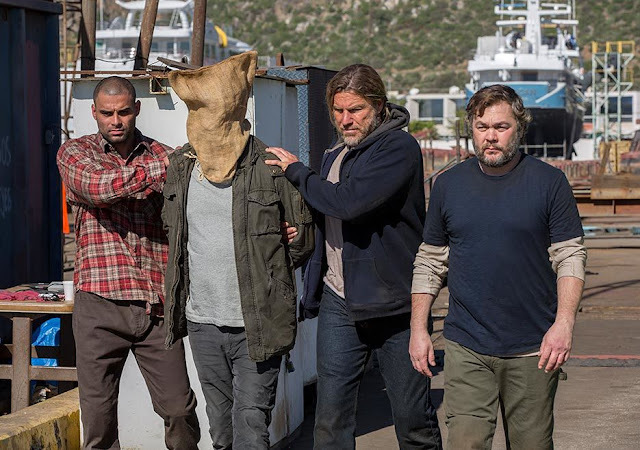 But I am sorely disappointed in Episode 5 titled, “Captive,” where Madison makes a one-woman rescue/trade for Reed, the brother of the pseudo pirate Connor, for Travis and Alicia, who at the end of the fourth episode were taken captive. Chris has reached new levels of annoying with his constant whining, not coming to grips with reality, and causing even more trouble by offing Reed that complicates the prisoner swap. And that swap was the dumbest ever. Connor’s goons go to the docks sans any guns! Really? After these guys shot up some skiffs they go to the docks unarmed? Really now. If in the days after the zombie apocalypse, Connor’s group has taken to some form of piracy then they would be a little more ruthless. They simply hand over Travis without bothering to ask if Reed is all right. I’d say that it doesn’t all check out for FTWD this second season. Strand, Nick and Travis to a certain degree, seem to be to get it. Everyone else, after 11 episodes remain incredibly stupid. Risk of death (a story of survival where every episode every character is at danger). I think at this stage, I’d like to see some of the main cast shift this mortal coil not to move the story forward but because they are annoying. There’s the aforementioned Chris. And what the heck about Strand? I can understand that he wants to rescue his gay lover his motivations do not seem to be well thought out. He is one of the first cast members to figure out what is going on yet he probably should know that bringing a large number of people with him would compromise his ulterior motive of rescuing his lover and heading out to Mexico. Viewers are part of core survival group (attachment). During the first two seasons of TWD, we all immediately gravitated to Rick, Glenn, Daryl, Andrea, Michonne, and others (Carl was the annoying one so I figure if he’s around so would Chris to annoy more viewers). The cast of TWD has grown on viewers who have had invested in the show that they get really upset when someone becomes zombie food. I think there are good characters. Nick’s recklessness or fearlessness is somewhat refreshing. Ruben Blades’ character of Daniel Salazar has a lot of potential. Travis and Madison have become the emotional centers for the cast. Now this lot has to decide whether they are a family or a bunch of disparate strangers. Alicia, played by the beautiful Alycia Debnam-Carey, is finally adding more depth. But after five episodes in this S2, it's high time that the films writers and directors move not two steps back stupid but several steps forward. I find S2 taking too long in its set up and for characters to become fully fleshed and attached. and they really need to ramp up the danger levels coming from the living. Make no mistake, I enjoy FTWD. I look forward to every episode. As I wrote earlier, I feel that FTWD’s S1 was in some ways even better than TWD’s debut season. But this S2 for FTWD is taking too long to go where they need to go. No need to rehash S1, move forward in a bigger way. I think at this point the conflict is more from within than from the outside Connor’s poor real threat notwithstanding. There are three more episodes before we hit a season break. Let’s hope that it picks up.